I was playing the Elder Scrolls: Skyrim video game at CES: a game I play often at home on my Xbox 360(s msft) and large-screened HDTV. Skyrim has stellar graphics at home, so today was no different. Well, there was one difference. I wasn’t playing on my Xbox. 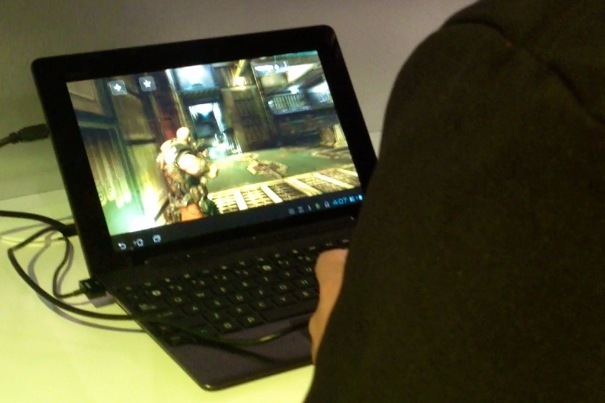 I was playing on an Nvidia(s nvda) Tegra 3 powered Android 4.0 (s goog) tablet. During a stop at Nvidia’s CES booth, I got a chance to see games such as Skyrim and Shadowrun on big screens, along with a new 7-inch Tegra 3 Android tablet from ZTE. All were impressive as you can see in this short video. Most impressive was that Skyrim was actually running on a Windows desktop and being remotely rendered on the Transformer Prime via Splashtop’s software! The first games were played on the Asus Transformer Prime, the first quad-core Android 4.0 tablet. With the optional keyboard dock — which has a battery inside of it — the whole set up can run for more than 20 hours. And yet, the device can push console-quality graphics on its own screen, an HDTV, or both. I was very impressed, even though I didn’t kill the dragon in Skyrim; clearly it’s not the silicon that’s the problem. ZTE’s 7-inch Android 4.0 slate was also running a Tegra 3 chip and showed similar performance in a smaller package. I haven’t heard about any pricing or availability for this slate, so stay tuned. And we’ll be waiting a few months to see products with Nvidia’s DirectTouch solution on Android devices. The company can remove the touch controllers from devices and have the Tegra 3 GPU interpret touches. The result: up to three times better touch performance, which could help remove Android’s laggy feel. Although not in the video, I spoke at length with Nvidia about its opportunity with Windows 8. And why not? The market is wide open now for all chips that use the ARM (s armh) architecture. From what I saw today, Windows on ARM won’t necessarily mean a poor experience. That feature is obviously not meant for you guys that are shooting it down. The feature is for fools like me that have 1 to 2 hours down time between classes and i don’t have time to drive 34 miles back home just to continue playing my skyrim. On Live is good, but if you ever tried it, the graphics aren’t top of the line. And i dont feel like rebuying all my games i spent full price on steam. This is better than onlive b/c instead of a community server you’re beaming the game straight from your own pc. In which you know what to expect in terms of quality and such. That’s cool that it has an awesome graphics chip, but why would would I play a PC game on my tablet when I could use the Desktop that it’s wired to 5ft away? I’d rather games be written for Android that can take advantage of the chip and run locally; then I’m not dependent on a super-fat pipe to play a game. yawn, misleading article is misleading. I’m really not sure why you found the Skyrim demo impressive. From the guys description it sounds like all the hard work is being done on the desktop and then the video output is just being streamed to the Transformer. This sounds very similar to what OnLive is doing already. It’s also fairly similar to what AirPlay mirroring does. The low lag does sound like an advantage however I wouldn’t be surprised if a lot of that is down to the network connection. I’m wager that there was a wired connection between the desktop and Transformer. Quoted from the article. “Most impressive was that Skyrim was actually running on a Windows desktop and being remotely rendered on the Transformer Prime via Splashtopâ€™s software!”. Read the article, then start commenting on it.